Mystic Quest by Laura & Tracy Hickman. Promise of the Witch King by R. A. Salvatore. This week we talk to Tracy Hickman about his new book Mystic Quest. A book that he worked on with his wife Laura. It is Book 2 of The Bronze Canticles series. 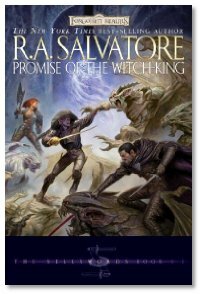 Next up, We talk to Bob Salvatore about his next Dark Elf book Promise of the Witch King. Both Bob and Tracy are return guests of the show, so we spend a lot of time talking about other things besides their books. This week's Library Segment is back to the business of books, books, and more books. Michael & Evo feed jointly this week. Shoes to help get you across the border? Actually, it was in the show notes for Wingin' It #37, which was last week's show. And come to think of it, I've never seen links or promos listed in the show notes for Cover to Cover... something we will have to change real soon now. Hey Mike, can you post the link about the lady making the $250 'Air-Migrant' shoes for Mexican Safety? Here you go. This is not the one that I stole from the bar in Pine Top, but it has a nice pict of the shoes. Pick up a pair today! Do you guys not even realize this is - National Buy Me Something - month?! Man... those brain cells are disappearing quicker and quicker. Please make sure to get Tracy Hickman back for the final novel review when it comes out. He has a very amusing outlook on life, and I'm heading towards Amazon right now for the first two because he rocks. Michael, where is your Amazon wish list. Maybe some of us fans can chip in on one of your wish list items! I have expensive needs. Mostly all for the studio. Happy "Buy me something month."